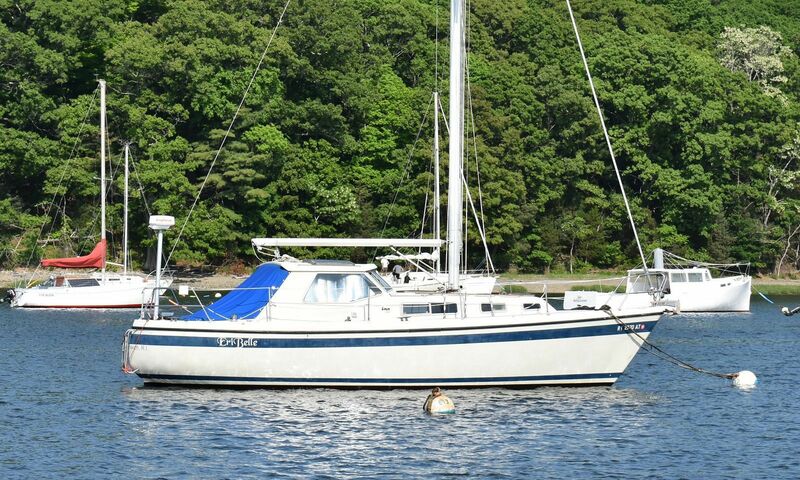 Danish craftsmanship and excellent sea keeping ability are a couple of the highlights of this pocket cruiser. Complete list of standard equipment plus Radar, GPS, auto helm, Bimini Top and cockpit cover. Auxiliary power furnished by a reliable Yanmar 27hp diesel. 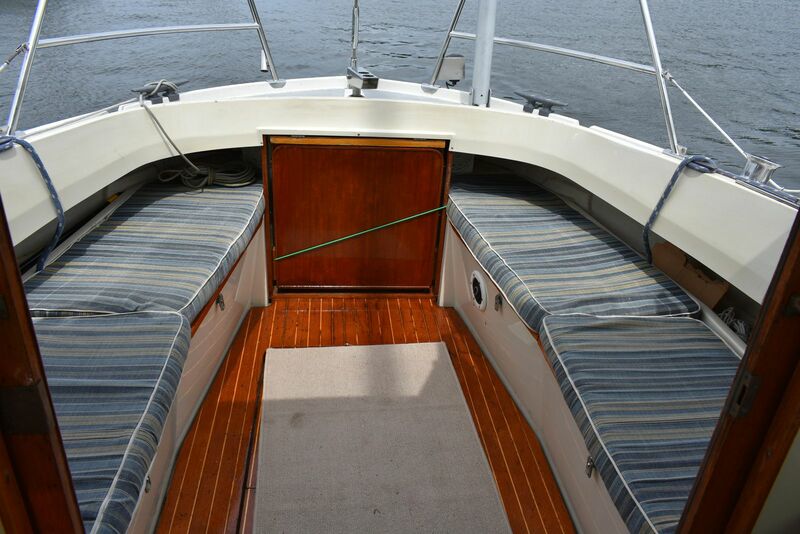 The original owners used her extensively and enjoyed cruising the inter-coastal waterway. The current owners day boat and cruise Narraganset Bay. Eribelle’s cockpit is sizable,deep and comfortable. There are bench seats on each side of the cockpit, and a large fold-out table easily can seat six. There are lockers under each of the bench seats—propane tanks on the port side—and a huge locker under the cockpit sole. Going below you enter the pilot house. On the port side of the pilothouse is a compact galley, with a two-burner propane stove and a small sink. 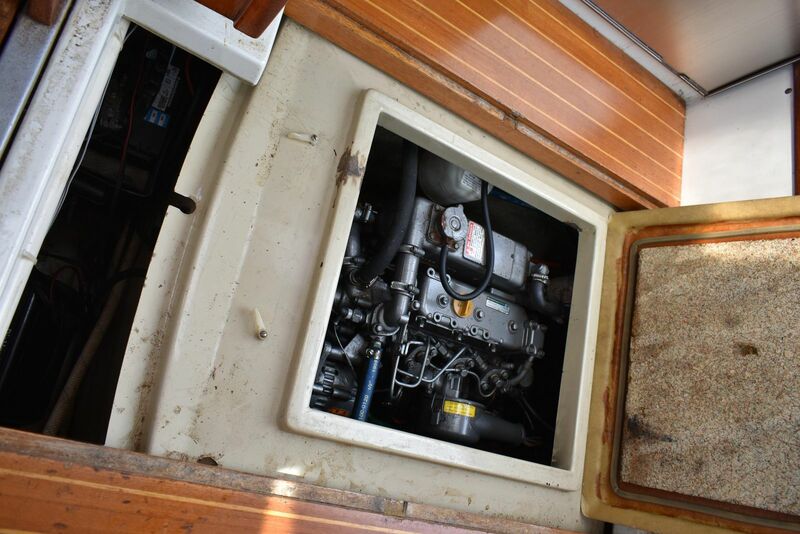 The front-loading refrigerator is underneath the stove, and storage drawers extend all the way outboard to the hull. To starboard is the helm with the chart table immediately ahead of the wheel. 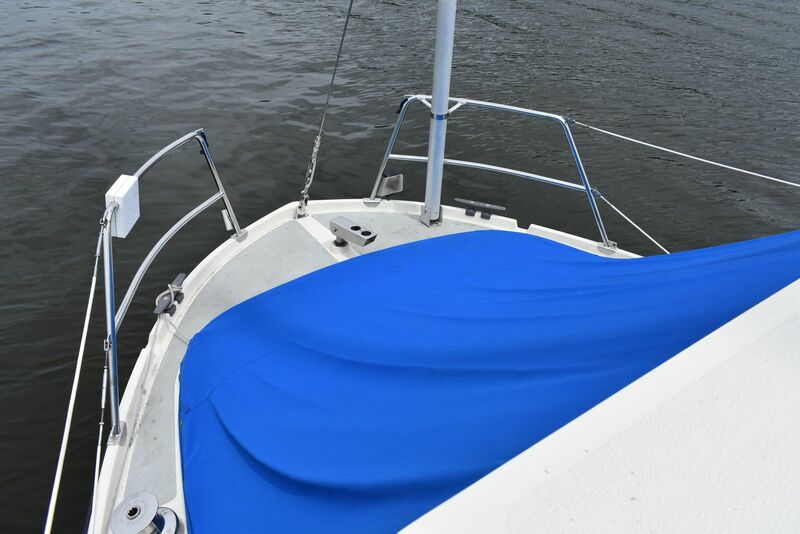 A raised captain’s seat and a second fold-up seat that slides out so two people can share the helm. 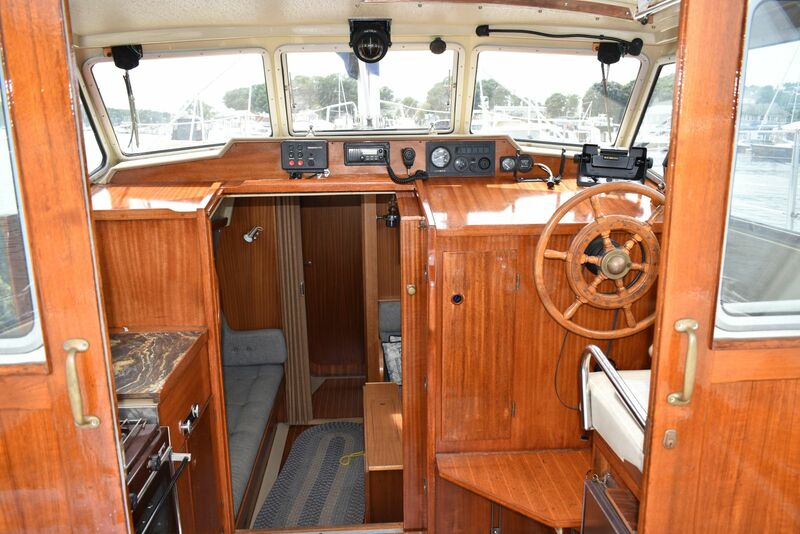 A wood steering wheel is immediately ahead, and engine controls, the electrical panel, and sailing instruments are directly in front of the helmsman. 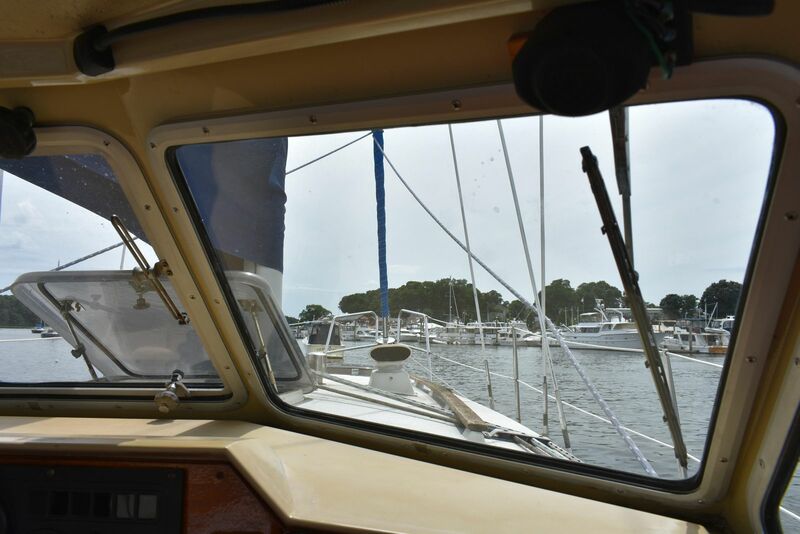 The pilothouse’s front windows have windshield wipers, and the front center window opens up for ventilation. A sliding hatch above the wheel and seat allows the helmsman to stand up for a good view of the sails, deck, and seas. 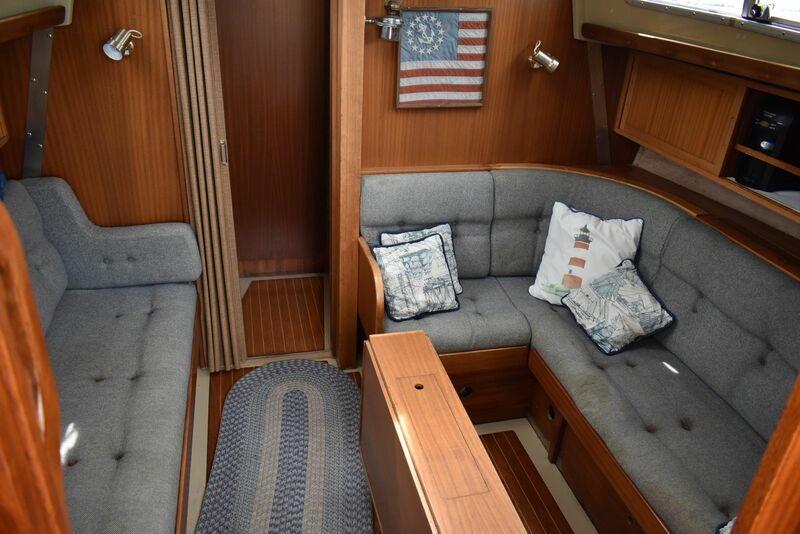 The pilothouse steps down into the saloon, which has a settee on the port side and a dinette/double-berth to starboard. Forward of the saloon is the head to starboard, with a hanging locker opposite. The head also has a teak grating above the sump, making it possible to shower in the head. Fixed ports on each side offer lighting. 12v interior and exterior lights. Manual head with holding tank. The rig is a single-spreader masthead sloop. The chainplates are close to the deckhouse, so the sidedecks are adequately wide. At the top of the rudder-stock is an attachment spot for the removable tiller, which can be used if you want to sail from the cockpit rather than from the pilothouse. 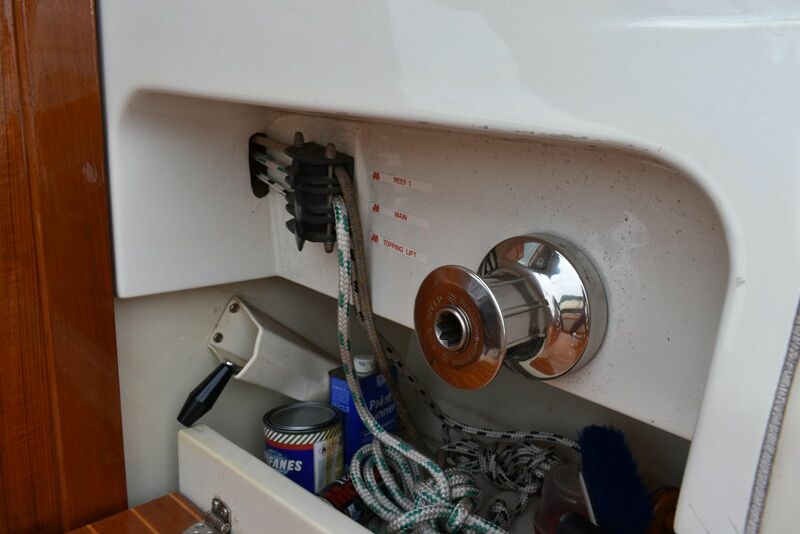 The wheel steering in the pilothouse has a mechanical disconnect so the tiller moves freely. 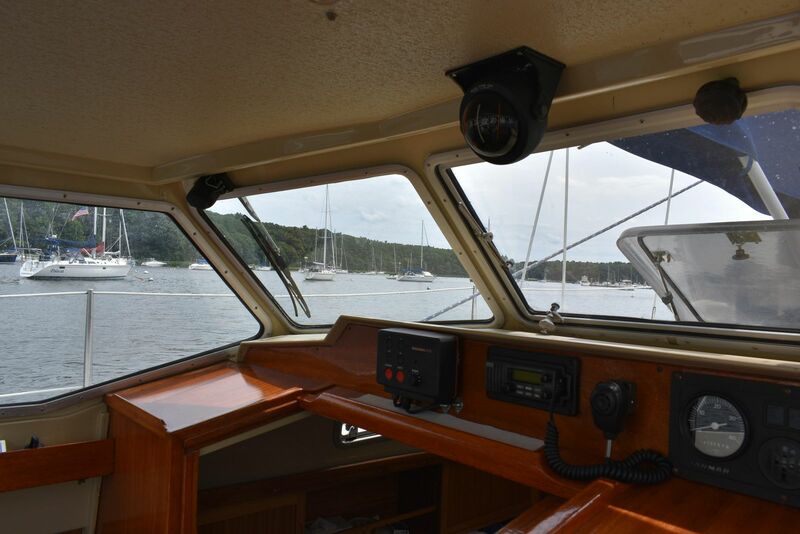 At the forward end of the bench seats on each side are the halyard and reefing lines, which run inside a channel on the side of the pilothouse and terminate in cam cleats in front of stainless winches. The main sheet has a single cam-cleat attachment point at the back edge of the pilothouse, and the sheet hangs down into the cockpit. Main sail and furling Jib. Excellent visibility in the pilot house with windshield wipers and center opening windshield. Large hatch over helm for ventilation and added viewing. standard equipment, including lifelines, pulpits, speedometer, depthsounder, boarding ladders, anchor and rode, fenders, fire extinguishers, and even dishes and cutlery.